This chair and ottoman set reflects a transitional furniture style. It is built by a manufacturer who is known for creating quality furniture that stands up to family use. The style is designed to allow this chair and footrest to blend with an assortment of different styles including casual, contemporary, traditional and transitional. The seat cushion on the chair is loose so it can be flipped over and the back cushion is semi-attached. This living room chair and ottoman is complete with welt cord trim tailoring for a finishing accent. The 1884 and 1887 Chair and Ottoman with Rectangle Shape by England at AHFA in the area. Product availability may vary. Contact us for the most current availability on this product. 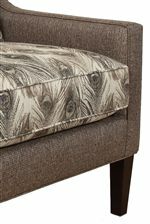 The 1884 and 1887 collection is a great option if you are looking for Transitional furniture in the area.